Ukraine’s military was already severely overmatched against the Russian-backed rebels it began fighting in the east back in 2014, and its drone forces have proven to be spectacularly subpar. At the beginning of the war, the Ukrainians used Soviet-era Tu-143 “Flight” drones. They were so ancient that they didn’t have motion cameras and only took still shots that had to be processed. Of course, it didn’t take much for rebels to shoot these flying dinosaurs out of the air. Now Ukraine is turning to crowdsourcing and civilian drones to try and address this problem. With a procurement military budget of just $500 million, Ukraine is extremely limited in its ability to buy first-rate drones to support its combat operations. Consequently, it has had to hit the consumer market for less expensive alternatives. Ukrainian citizens wanting to avoid the graft of working through the country’s military structures began crowdsourcing campaigns to purchase civilian drones, including DJI Phantom 2s, a Skywalker X8, and an Oktopcopter. (The average Joe can even buy them online.) Most of these are equipped to do surveillance, but their campaigns are pretty simple: any drone is better than the Tu-143. The challenge with civilian drones are, well, they’re made for civilian use. They are susceptible to jamming and suffer from short battery life and limited travel range. Hope came in 2014 when startup UKRSPECSYSTEMS began making drones with commercial components. The company primarily functions as a Walmart for Ukraine’s military, in that it creates military-style drones for a fraction of the cost. Most of the drones are “usually used for field reconnaissance, air surveillance during emergencies and natural disasters, objects air inspecting,” and “all this allows to assess the situation beforehand and save people’s lives,” according to its website. 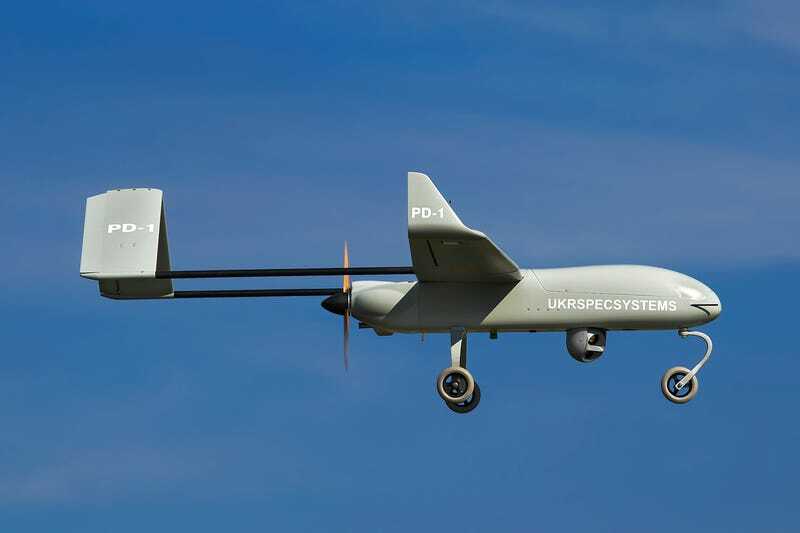 UKRSPECSYSTEMS also helps Ukraine because it is often too complex to import foreign drones with strict customs laws. Their first crowdfunded drone was the PD-1 (“People’s Drone-1"), a piston-engined aircraft with a ten-foot wingspan. This carried a gimbal-mounted video camera with flights lasting more than six hours, providing eyes in the skies on the frontlines. An incredible assortment of small, privately developed drones like the PD-1 appeared from odd sources, with some being provided directly to militias like the Spectator, designed by students from Kiev Polytechnic Institute. There was also the Stork-100, Rama, and Apus 1505—all small tactical drones with similar roles. A report on the official Ukrainian military news site says 30 different kinds of drones have been used. But one drone that stood above the growing multitude was the A1-CM Furia (“Fury”), made by startup Athlone Air. Founder Artem Vyunnik says he began working on a consumer drone long before the war, but modified the design to meet the country’s needs when fighting erupted in Donbass on June 2014. The electric-powered Fury has a seven-foot wingspan and an two-hour flight time. Its camera has a zoom powerful enough to distinguish whether someone is carrying a gun or a shovel from 500 meters away, and has performed well in the field. 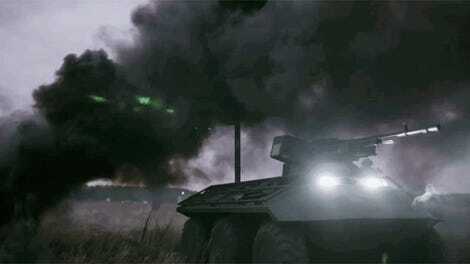 A Fury costs anywhere from $10,000 to $22,000, a manageable price for a cash-strapped military. By comparison, the U.S.-made RQ-4 Global Hawk drone costs close to $130 million. Ukraine could only buy three of our top-notch drones and have little left over for other purchases. This is the reality Ukraine’s armed forces in 2017. Their soldiers have to go to war on the cheap, which is pretty impossible because financing a war is one of the most expensive enterprises a government can manage. As I wrote yesterday, Ukraine has had to look inward for resources since it is not a NATO member and the West refuses to arm its military with lethal weapons. This has challenged Kyiv to become more creative with how it uses its military resources and, in the case of its drones, create them. The country has had to borrow hundreds of millions of dollars just to keep itself afloat, so it is hardly in a position to move any of its already limited government coffers to a war it is not responsible for starting. Fighting on a Walmart budget is not the best way to fight a war against one of the world’s most powerful militaries, but the Ukrainians are proving to be quite creative with what they have so far.